Huntington Beach, California is not only a Volleyball and Surfing destination, but it is a town of restaurants and bars steps away from the ocean making it not only a vacationer's paradise, but also a paradise for locals. HBPD employs approximately one officer for every 1000 residents, but of course the number of people in Huntington Beach during the summer or weekends swells. 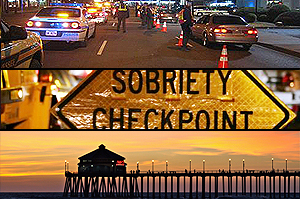 Checkpoints and DUI saturation enforcements are common and this year the Huntington Beach Police Department has conducted five of these checkpoints. However, checkpoints are time consuming, require a lot of personnel and do not render many arrests, but DUI saturation patrols do and are more commonly used especially in the evening and late night hours in the Main Street area of Huntington Beach. A police officer must have reasonable suspicion to stop a motorist, but that stop may be based on something as simple as a brake or license plate light not working or as dangerous as weaving in a serpentine manner down Pacific Coast Highway. Either way, once a police officer has reason to stop the vehicle, that stop automatically turns into a DUI investigation if the officer smells alcohol when contacting the driver at their window. If alcohol is smelled or any other behavior is exhibited in which the officer believes the driver is impaired, the officer will immediately start asking questions about alcohol consumption, marijuana smoking, prescription medication ingestion, depending on the situation. The driver can then expect to be asked to exit the vehicle, where a battery of coordination and balance tests, called field sobriety tests will be administered. Although the Huntington Beach Police Officer has most likely already determined that the driver will be arrested on contact at the vehicle's window, these tests provide the officer and later the Deputy District Attorney who reviews the case, and potentially a jury who listens to the case in court, more incriminating evidence against the driver. These tests are not easy, especially when done on the side of the road in a stressful environment. The police officer then may offer the driver a breath test at the scene. This breath test is called a Preliminary Alcohol Screening test and in Orange County it is Intoximeters Alco-Sensor IV which most likely will be used. This is a test that an officer may use prior to arresting the driver to ascertain the blood alcohol level at this time of the investigation. If the officer is wrong and the person is way below the .08 alcohol level and has not ingested any other impairing substances, the officer may release the person. However, if the person is near, at or over the .08 level the driver will then be arrested. The driver will then be given a choice of a breath test or a blood test. The blood test is more accurate, because it is a direct test from the blood and is not converted from breath to blood as with the breath test results. The breath test may also be inaccurate for other reasons. However, with a blood request the driver has more of a possibility of spending the entire night and potentially some of the next day in jail while the breath test may result in a faster release. However, there are no guarantees of a release time. If this is the first time the driver has been arrested for a DUI they will be released on a promise to appear or citation to appear in court. If this is not the driver's first DUI arrest, the driver may be required to post bail in order to be released or will remain in jail until the court date. The court proceedings will take place at the West Justice Center. An Orange County Deputy District Attorney will review the police report and file charges. Most of the time those charges consist of two counts of California Vehicle Code Sections 23152(a) and 231452(b). The (a) count is driving under the influence of alcohol and/or drugs and the (b) count is driving with a .08 percentage of alcohol in the blood. The court process starts with the Arraignment where a not guilty plea is entered so there is time to investigate and negotiate the case at the pretrial hearings. If the case is not eventually resolved at these hearings, then the case is set for a jury trial where twelve citizens will listen to all the facts of the case and determine if the driver is guilty or not guilty of the charges. An experienced Huntington Beach DUI Attorney can analyze all the evidence, understand the legal ramifications and defenses, and present those defenses and mitigating factors. I am a member of the National College of DUI Defense and understand the challenging Court and dmv issues of a DUI case. Call me immediately for a free consultation (949)275-6377. To keep this short and simple, I was being charged with my second DUI and was facing jail time and more. Rosanne was able to get me the best deal possible for my case. It was everything I had hoped. She was on top of everything and I had complete confidence in her work. I would recommend Rosanne to everyone.